Now you can read this stuff for yourself – I’ll just point the way to some of it – but what do you think are the main reasons behind the increase in childhood obesity? It’s not all down to genetic disorders or over indulgent parents or too many children locked up without access to friends…is it? The one thing I do know is that if you are an overweight child then you’re in a place of misery with your peers making constant fun of you. If there is anything we can do to help young people avoid this them we need to be doing it. So…what do the good people of Northern Ireland feel about this? Are we heading the way of American children? What can be done to stop the trend? How much of this is down to lack of exercise and how much is down to poor diet and convenience foods? How much of this is the responsibility of advertising that encourages poor diet choices being constantly aimed at children? What more can our schools do through education? Can they do anything at all? I do know when I see kids on the way to school these days they always seem to be stuffing their faces with junk food like crisps and coke. Any docs out there with bright suggestions? PS – the world’s fattest person seems to be Manuelo Abberazo from Mexico who tips the scales at 1215lbs. An no…. that is not a holiday snap of he talkniadmin! This entry was posted on Thursday, June 14th, 2007 at 1:31 pm and is filed under Education, Health. You can follow any responses to this entry through the RSS 2.0 feed. You can leave a response, or trackback from your own site. 12 Responses to Childhoood Obesity. So basically this flawed magic bullet is available for purchase around the world but isn’t safe enough to satisfy the American agencies. Isn’t it time we did this type of thing on a worldwide basis? If it isn’t safe for use in the USA then if should not be on safe anywhere in the world, should it? But then… the drug is made by a French company so maybe the Yanks are just protecting their market for their own drug companies? For some people it is difficult to lose weight because t hey have become so acustom to their eating habbits that they don’t realize the amount of calories, carbohydrates, fats, etc. they consume. Obesity begins at early stages in a persons life either because their culture, place of birth, or the way their parents feed them. It’s not really a kids fault if their parents feed them eg. 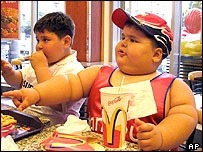 Mcdonalds everyday, or other foods that are high in calories or fats becuase he/ she does not care what goes into their mouth as long as they make them feel good. Certain places such as Texas, have a high percentage of obesity and this shouldn’t be. Places like this should devout their time to lowering those percentages because obesity has become one of the major causes of deaths. By creating foods that are high in protein, “good carbs”, and essential vitamins, the rate of obesity would decrease damatically. I am concerned because in The US, foods that are unhealthy are usually cheaper than foods that are healthy. (healthy food = luxary) Thank you for your concern! obesity is a major cause of deaths! lets build programs for kids who underaged for gyms and obese! !